High tables with round shape or as an irregular quadrilateral and low tables with ovaloide shape, realized in mm. 15 thick transparent extralight glass. 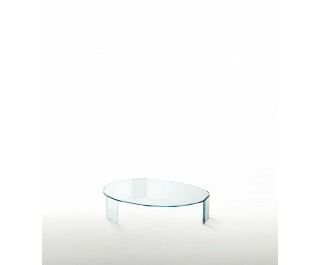 The top and the feet have facetings obtained by means of special chamferings of the glass. The legs of the high table can be disassembled and they are fixed to the top by means of sophisticated steel plates. Instead in the low table the legs are glued directly to the top.